The man who in the fifties went fishing for trout in the river Aveto along with Ernest Hemingway now lives in Varzi with his wife, Lina Buscaglia. The author of "The Old Man and the Sea" wrote in his short stories about the Aveto, comparing it, because of its savage beauty, to some American rivers in the Rocky Mountains area. Many readers thought that his reference to the Aveto was only a figment of imagination or a story local people used to tell. We have found sound evidence of this story from Mr Luigi Peppino Callegari, who was born in 1912. Mr Callegari says: "In the early fifties I had just opened another dentist's surgery in Bobbio, and while I was there a friend of mine, Mr Bellocchio (a lawyer from Piacenza), got in touch with me to know w hether I could go trout fishing in the Aveto with his guest, Ernest Hemingway. The novelist arrived in Bobbio driving an American jeep, a war surplus. We took Val d'Aveto from Marsaglia and we rested in Salsominore. There we went to a tavern and, even though he had not eaten any meal yet, he drank two bottles of white wine from Piacenza hills. We had a good haul and at midday we ate a whole "nisso" cheese. We talked about the Spanish Civil War, the First and Second World Wars and the partisan war in Val Trebbia and meanwhile we also drank five more bottles of white wine. The way back to Bobbio was quite venturesome because Mr Hemingway drove recklessly and the jeep kept on skidding on the road, that was full of bumps and holes. We stopped in Piazza San Francesco, we embraced heartily and he sang my praises for being good at fishing and he also talked about the white sparkling white we drank in Salsominore, since he liked it so much. 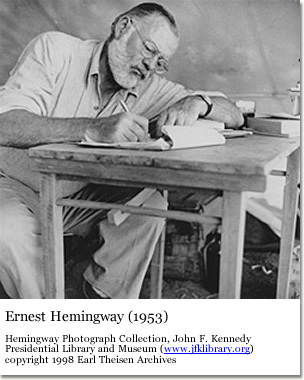 After that day we never met again and we did not keep in touch, but Ernest Hemingway's memory is still very dear to me."